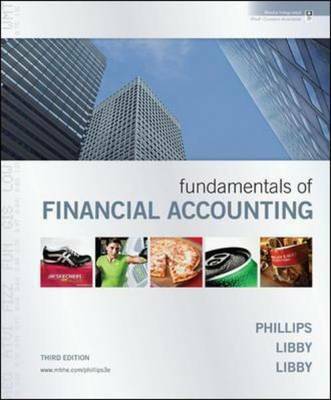 "Fundamentals of Financial Accounting" presents an engaging, balanced, and appropriately paced analysis of the fundamentals of financial accounting. Its conversational writing style makes it easy to read and understand, while the selection of real focus companies reinforces the relevance of accounting by introducing students to accounting and business activities in the context of their favorite companies. Balance between preparer and user orientations is achieved throughout the book, by studying both the accounting activities that take place inside the company, as well as evaluating their impact on decisions, and users outside the company. Topic coverage is paced appropriately for students new to accounting, and is thoroughly reinforced every step of the way with an ample variety of innovative pedagogical tools. Clearly understandable, relevant, and accessible, "Fundamentals of Financial Accounting" is simply the most student-friendly financial book on the market and provides the tools for students to grasp financial accounting from the ground up. Bob Libby is the David A. Thomas Professor of Management in the Johnson Graduate School of Management at Cornell University. He previously taught at the University of Chicago and the University of Michigan. He received his Ph.D. from the University of Illinois. Bob has a national reputation as a leading academician and is one of the top five behavioral accountants in North America. Bob teaches MBA and Executive MBA courses in Financial Accounting at Cornell. Please note: Bob Libby is teaching at Univ. of Texas at Austin through June 1, 1999. Pat Libby is an Associate Professor at Ithaca College. She received her Ph.D. from the University of Michigan. Her research activities focus on how to use cases in introductory accounting and on using Collaborative Learning techniques in the classroom. She teaches undergraduate introductory, intermediate, and advanced Financial Accounting at Ithaca. Dan Short is the Dean of the Richard T. Farmer School of Business at Miami University. Prior to that he was the Dean of the Business School at Kansas State University and prior to that he taught at the University of Texas-Austin and the University of Chicago. He received his Ph.D. from the University of Michigan. He has won numerous teaching awards during his career teaching both undergraduate and MBA financial accounting courses. Pat Libby is an Associate Professor at Ithaca College. She received her Ph.D. from the University of Michigan. Her research activities focus on how to use cases in introductory accounting and on using Collaborative Learning techniques in the classroom. She teaches undergraduate introductory, intermediate, and advanced Financial Accounting at Ithaca.